When a start-up business is growing quickly and everything is humming there is no better place to be. Which is one of the reasons why I’m excited to be involved with Fishpond – I’m an investor and also work with them as an advisor. 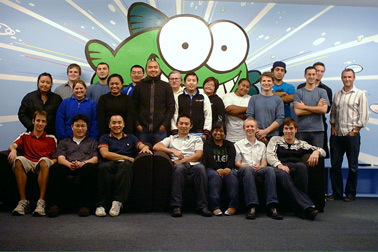 From their warehouse in Auckland, Fishpond run Australasia’s biggest online store, shipping books, movies, games, music and (just added) toys to customers around New Zealand and Australia and around the world (it’s a great place for ex-pat Kiwis to source their Outrageous Fortune fix from overseas, for example). They are currently looking to add some more smart PHP developers to their team. There are both junior and senior positions available. I think this is a great opportunity – a chance to work on a busy and popular website, which still has lots of room for improvement, and some complex back-end warehouse systems, and be part of a team that has a big influence on the success of the company. If this sounds like you (or somebody you know) I’d encourage you to check out the job descriptions and apply. The main issue is their pricing. All the books I’ve looked at in the past were more expensive on Fishpond than other shops in NZ. Some times it was cheaper to import from Amazon and pay the huge shipping fees from the US. To back up my findings I compared some pricing on the Fishpond site with other NZ shops. “Harry Potter And The Half Blood Prince” is featured on the Movies page, and is $39.99 (down from $51.99). That seemed expensive for a DVD, so I looked at the Warehouse and the same movie costs $29.80 which shows a saving of $5.19, making the usual price $34.99 – still well below the Fishpond price. On the Music page Fishpond have the Twilight Soundtrack featured at $32.97. Again, this seems expensive for a CD and a quick look at The Warehouse shows they have a special edition of this soundtrack (which includes an additional DVD) for just $21. Fishpond claim to have: “New Zealand’s lowest prices. Guaranteed.” The guarantee seems to only include local, online bookstores, which rules out The Warehouse pricing. I looked at the Whitcoulls website and compared the first three books featured on the Fishpond Books page. “New Moon”, “Touch the Dark”, and “Love” are ALL cheaper on Whitcoulls. I didn’t bother comparing any other prices. I’m guessing that Fishpond aren’t even bothering to compete on price. Instead if someone goes to the effort of finding a cheaper price, Fishpond will just take the 10% credit hit (and note that this is an account credit, and not a refund – so the money will go back into Fishpond anyway.) It’s a good (but obviously slimy tactic) as Fishpond will have made more profit on the other sales where people haven’t noticed they aren’t the cheapest. Again, I don’t mean to flame, but it really annoys me when online retailers (especially those in NZ) are so expensive. Wow – that was a sort of bizarre reply? I just did quite a few checks on price, and about 75% of the time Fishpond was cheaper than the other online stores? Anyway – there are several ways to check what is the largest store – hitwise (fishpond #1), alexa (fishpond #1) – being local stores of course. And don’t forget fishpond has a big australian website too – whereas these other NZ online stores are much smaller and just located in NZ. And hey – the credit 10% thing is quite smart – fishpond has about 2.5 MILLION products – everything has to be automated, you can’t have people doing everything manually. And obviously automated processes can never overcome manual adjustments by competitors, so giving your customers some relief and payback on that is a good thing. What do you do, stuarm? are you some sort of competitor employee, or fanboy? I have to agree with Stuart, fishpond are expensive compared to Amazon. I guess that makes me an amazon fanboy! But great that they are growing quickly, hopefully that means more purchasing power, and lower prices, and they turn into Australasias amazon equivalent. If I was better at PHP, I might be interested! I’ll be super-interested if they follow Amazons example of becoming the default logistics operator for small retailers (providing infrastructure, warehousing, online shops etc etc). I love that about Amazon! I too went to Fishpond a few months back to buy my dad a book that was recommended to me only to find it $20 more expensive than Whitcoulls ($30 versus $50). I was an early employee of Fishpond back in 2002-2004 – was solely responsible for the Linux distro department. I still remember the days when I was burning off 20+ discs when the new Ubuntu or Fedora came out and even endured the 14+ CDs for a full Debian distribution every once in a while. The Linux department when broadband really came into its own and after a short stint selling surplus stock on Trade Me from their aborted T-shirt department, I handed in my notice. There really wasn’t much else a guy from Invercargill could do. But I still use them heavily – I’m a five-star user. Being automated and having the 2.5million products means they have a better chance of having the obscure title I want. Back in the day, if there was a specific title I wanted to order, they would go beyond the call of duty and manually add it into their database for me. Would it be possible for you to arrange for me to get a new password on Fishpond. I have lost mine and cannot access another one through their website. There is no way I can contact them directly as every way I try asks for the my password, so I don’t get anywhere. If you contact them at support@fishpond.co.nz they should be able to help you out with this. I am an affiliate of Fishpond and have a question about my earnings. There is no email contact for us and when I used other emails like “support” “service” @ fishpond etc I have had no replies. Can YOU sort it out for me? I can appreciate how frustrating that must be. I’m sorry. I will pass on your comment and ask them to contact you. Like most online businesses they have setup their customer support to encourage people to contact them via email, as that is the most effective way to provide a speedy response to a large customer base. And, generally it seems to work well. However, that system obviously breaks down when you can’t reach them via email for whatever reason.